In a jaw-dropping study published this week in the journal Environmental Health and funded by a Science to Achieve Results (STAR) grant from the United States Environmental Protection Agency, researchers at UCLA and UC Davis measured food-borne toxin exposure in children and adults and found high exposure to cancer causing compounds. By pinpointing foods with high levels of toxic compounds and determining how much of these foods were consumed, the researchers found that family members in the study, and preschool children in particular, are at high risk for exposure to arsenic, DDE (a DDT metabolite), dioxins, dieldrin, and acrylamide. These compounds have been linked to cancer, developmental disabilities, birth defects, hormone disruption and other health related conditions. Even relatively low exposures can greatly increase the risk of cancer or neurological impairment in children. But here's the good news, the study also points to dietary modifications that could reduce the risk. 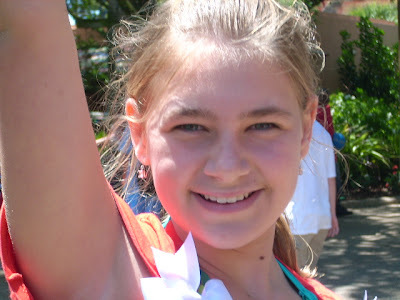 How Are Toxins Getting Into Our Food and What Is It Doing To Our Kids? "Contaminants get into our food in a variety of ways," said study principal investigator Irva Hertz-Picciotto, professor and chief of the Division of Environmental and Occupational Health at UC Davis. "They can be chemicals that have nothing to do with the food or byproducts from processing. We wanted to understand the dietary pathway pesticides, metals and other toxins take to get into the body." Researchers assessed risk by comparing toxin consumption to established benchmarks for cancer risk and non-cancer health risks. All 364 children in the study (207 preschool children between two and seven and 157 school-age children between five and seven) exceeded cancer benchmarks for arsenic, dieldrin, DDE and dioxins. In addition, more than 95 percent of preschool children exceeded non-cancer risk levels for acrylamide, a cooking byproduct often found in processed foods like potato and tortilla chips. Pesticide exposure was particularly high in tomatoes, peaches, apples, peppers, grapes, lettuce, broccoli, strawberries, spinach, dairy, pears, green beans and celery. "We focused on children because early exposure can have long-term effects on disease outcomes," said Rainbow Vogt, lead author of the study. "Currently, the U.S. Environmental Protection Agency only measures risk based on exposures of individual contaminants. We wanted to understand the cumulative risk from dietary contaminants. The results of this study demonstrate a need to prevent exposure to multiple toxins in young children to lower their cancer risk." The researchers used data from the 2007 Study of Use of Products and Exposure-Related Behavior (SUPERB), which surveyed households in California with children between two and five to determine how their diets, and other factors, contribute to toxic exposure. Specifically, SUPERB homed in on 44 foods known to have high concentrations of toxic compounds: metals, arsenic, lead and mercury; pesticides chlorpyrifos, permethrin and endosulfan; persistent organic pollutants dioxin, DDT, dieldrin and chlordane; and the food processing byproduct acrylamide. 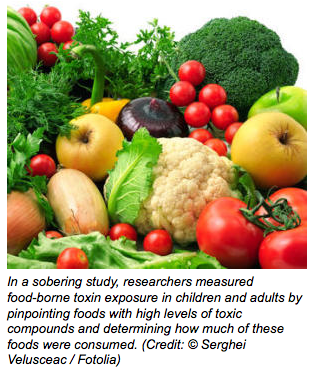 Toxin levels in specific foods were determined through the Total Diet Study and other databases. "We need to be especially careful about children, because they tend to be more vulnerable to many of these chemicals and their effects on the developing brain," says Hertz-Picciotto. Vary Your Diet - "Varying our diet and our children's diet could help reduce exposure," said Hertz-Picciotto. "Because different foods are treated differently at the source, dietary variation can help protect us from accumulating too much of any one toxin." Despite Recent Reports to the Contrary, Now More Than Ever, Go Organic - Organic produce has lower pesticide levels. Families Also Can Reduce Their Consumption of Animal Meat and Fats - Animal meat and fats may contain high levels of DDE and other persistent pollutants. Be sure to switch to organic milk. Also, while mercury is most often found in fish, accumulation varies greatly by species. Smaller fish, lower on the food chain, generally have lower mercury levels. Remove Acrilomides From the Diet - It is actually pretty easy to remove acrilomides from the diet. Acrilomides come from chips and other processed grains, said co-author Deborah Bennett, associate professor of Environmental and Occupational Health at UC Davis. "Even if we set aside the potential toxins in these foods, we probably shouldn't be eating large amounts of them anyway. However, we should be eating fruits, vegetables and fish, which are generally healthy foods. We just need to be more careful in how we approach them." 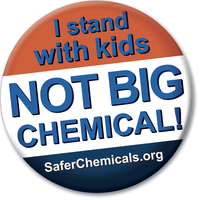 Be Vocal About Your Support for Safer Chemicals - The study also highlights a number of policy issues, such as how we grow our food and the approval process for potentially toxic compounds. Though the pesticide DDT was banned 40 years ago, the study showed significant risk of current DDE exposure. "Given the significant exposure to legacy pollutants, society should be concerned about the persistence of compounds we are currently introducing into the environment," said Bennett. "If we later discover a chemical has significant health risks, it will be decades before it's completely removed from the ecosystem." While the study has profound implications for dietary habits, more work needs to be done to quantify risk. Specifically, researchers need to determine how these food-borne toxins interact collectively in the body in their own toxic cocktail within us.